I grew up as the only girl with one younger and three older brothers, and there are six years between us from oldest to youngest. As you can probably imagine, there was a lot of activity in our home at all times, and the decibel level often reached the point at which hearing protection was required. We always knew when it reached that level because one of my parents would make careful note of it. My dad’s way of calling attention to this was to yell out, “Keep it down to a dull roar!” and one of us would invariably reply with a quiet “roar.” The decibel level would drop for a brief and respectful moment in order to pay due homage to the request before resuming (or exceeding) its prior level. Despite the impact on our hearing, one thing I often heard was that I looked just like my mom. I didn’t see the similarity but got used to hearing that and didn’t think much about it; I didn’t see why it mattered. There was, however, a different question that I began to hear more and more, a question that didn’t make any sense to me. I still wasn’t sure how to answer that question as it took a number of years before I could remember which brothers were adopted and which ones weren’t. All I knew was that I had four brothers, so this other term that seemed so important to others had no practical meaning for me. Why did it matter so much how we all became siblings? All that mattered to me was that we were all siblings. I was much older when I realized the impact that this would have on me. 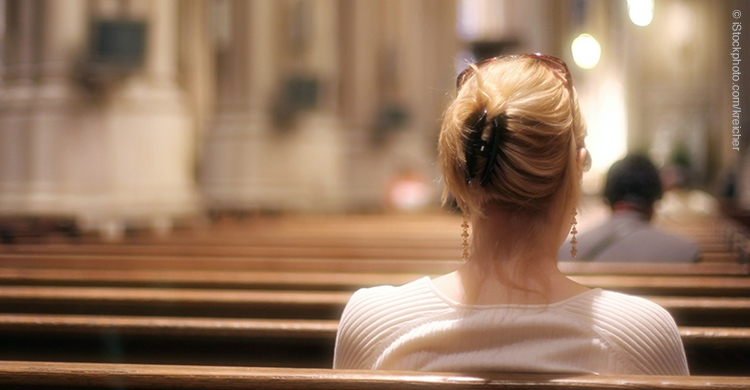 My parents raised us as Catholics, but practicing our faith was never all that important. We went to Mass every Sunday, Christmas, and Easter and attended religious education, but Mass was just something that we endured before going out for donuts. My parents began falling away from their faith at some point when we were young, but never spoke about why. Once we were old enough to walk or take our bikes to church, our parents stopped going to Mass since their only reason for going was to bring us, and we soon followed in their footsteps. Our parish was right on a pond (or a lake, if you’re not from New England), so if we stayed outside, we could go down and feed the geese that were often there, or just walk around the water’s edge until it was time to grab a bulletin (proof to our parents that we’d gone to church) and go home. If we actually went inside the church, then we would leave Mass as quickly as possible, which was usually just after receiving the Eucharist. As we got older and could drive, we’d go out for breakfast instead or just drive around until the Mass we were supposed to be attending was over. Of course, our friends knew what we were doing and often joined us. One of my Protestant friends joined us a little too often, and her parents put their foot down because they wanted her to go to her own church. They were apparently concerned that she might be on her way to becoming Catholic because of her frequent Mass non-attendance. That didn’t make sense to either of us for two reasons. First, they were both Christian churches, so we didn’t see any real difference at the time, and second, why did it matter which church we were skipping? The differences between my friend and me weren’t limited to our place of worship; we also had a different view on abortion. Her parents were pro-choice, and that seemed to be acceptable in her local church. I can’t recall many discussions directly about abortion, but at a young age, I had internalized the idea that it was wrong. As I entered high school and then college, the idea that abortion was wrong didn’t seem quite so obvious anymore. My staunchly pro-life position wavered as arguments in favor of abortion as an unfortunate side effect of compassion became more prominent. Although I still identified as a Catholic for a few years, eventually that fell away and I became a New Ager. I also began to identify myself as pro-life, but thought that abortion needed to stay legal. I’ve heard people argue that those who support abortion must have been involved in an abortion at some point in the past, but that was definitely not true in my case. Instead, I agreed with Bill Clinton’s statement that it should be “safe, legal, and rare” so that we could help women who were in such desperate situations that having an abortion was their only option. I saw myself as being compassionate by holding this opinion, since access to abortion meant that we could eventually put an end to poverty and suffering. This is why Planned Parenthood was not just necessary, but a good thing; I thought they were a free health clinic that provided compassionate care for women who couldn’t otherwise afford it. If abortions were provided, then I reasoned that they must have only been performed in a few desperate cases. If asked, I couldn’t give any concrete examples of these desperate cases. Any specific situation given as an example would remind me that I had two brothers who may very well have had birth mothers once in that situation, so I couldn’t say that abortion would fix that problem because it was unthinkable that they could have been aborted. I would never have admitted that I was actually supporting abortion with this position because, of course, I was pro-life! It was only after my reversion to Catholicism that I saw this for the lie that it is. There is nothing like a new convert or revert for wanting to know more about their faith. We’re like sponges that need to soak up everything we can find and we look everywhere for more information. Since I didn’t know that many practicing Catholics to ask, I began to search online. I did a search on the term “Catholic” and found Catholic Answers. I learned a lot about the foundations of Catholicism and grudgingly acknowledged that, if I were going to be a Catholic, then I had to be pro-life. I gave the assent of my will to being pro-life, but I didn’t advertise it. The problem was that I had no foundation for my position other than that “the Church says so.” Arguments that appealed to compassion for women and young girls who were living in poverty or abusive situations where having a baby would only worsen their conditions made me feel terrible about saying “no” to the idea of abortion as at least part of the solution. How could I justify not helping put an end to that woman or young girl’s suffering? I had no idea at the time how much an abortion would increase their suffering, and how much that would cause them to suffer for years afterwards; it wasn’t until I worked at Project Rachel that I truly understood how very much women—and men—suffer afterwards. With my return to faith, I began to listen to the Catholic Answers Live radio show, enjoying what I was learning and tuning in regularly. When they announced one day that the topic had something to do with abortion, I rolled my eyes but stayed tuned in. The guest for the day was Jim Sedlak of American Life League’s STOPP, and the topic wasn’t just abortion, it was the truth about Planned Parenthood. Prior to hearing Jim Sedlak speak, my view was that Planned Parenthood was a non-profit health clinic that provided free health care services to women, and that, while they may perform a few abortions here and there, it was a rare procedure and hardly worth discussing. But as Jim spoke, hammering away at those misconceptions, I was stunned. I’d never heard anything like this about that company. The truly destructive blow came when he talked about how many millions of dollars in profit Planned Parenthood earns, and for how many years they’d been earning profits in the millions. My illusions were shattered and the final scales fell from my eyes. This wasn’t compassionate care for women in need; this was making money by taking advantage of women in desperate situations. How could I ever support this? I visited some of the websites that Jim mentioned, including American Life League. I had heard about pro-life protesters who showed horrible pictures of aborted babies, but hadn’t actually seen them myself because I usually avoided those gatherings. When I saw some of the photos online, I was truly horrified. That’s when I realized that the pictures people talked about weren’t just graphic and disgusting drawings; they were photographs of what had happened to babies who were aborted. After hearing Jim Sedlak and after doing more research on my own, I knew I could never again be anything but completely pro-life, without exceptions. I could finally see that all of the reasons in favor of abortion being safe, legal, and rare were good reasons to help women, not to kill their children. I began going to Planned Parenthood in Boston to pray the rosary with the Helpers of God’s Precious Infants on a regular basis, and prayed on my own even more often. I worked for a short time with Project Rachel and saw a great deal of suffering, but also amazing healing through their extension of God’s mercy to men and women who were suffering from past abortions. Today we need to attack abortion on all fronts. The practice of abortion will only become truly unthinkable when we accept the grace that God extends to us. The excuses and scales obscuring our ability to see the truth can be penetrated by reason, but only conversion and accepting His grace will make them fall away completely. Since 1995, American Life League’s STOPP International has been involved in shutting down 200 Planned Parenthood facilities, 20 in the last year alone. STOPP’s website (STOPP.org) offers a wealth of statistics and analyses, reference materials, and an overview of the plan to shut down Planned Parenthood facilities. Jim Sedlak has instructed and inspired many through writing and speaking—as on his show, “Armed for Battle,” broadcasted every Friday on Radio Maria (RadioMaria.us) — making him one of Planned Parenthood’s worst enemies. Jim’s wisdom and guidance has inspired a new educational video, Who was the Real Margaret Sanger?, produced by American Life League’s Culture of Life Studies Program. The video series details how Margaret Sanger, the founder of Planned Parenthood, changed America’s mind about birth control. Visit the Culture of Life Studies Program’s website (CultureOfLifeStudies.com) to learn more about this important video series produced to keep today’s students from becoming tomorrow’s Margaret Sanger. Amy MacKinnon earned a BA in Psychology from the University of Massachusetts Boston in 2003. In 2010, she earned her MA in Theology from the Notre Dame Graduate School of Christendom College with a specialization in catechetics. In 2013, she earned a STB and is currently working towards an STL at the Dominican House of Studies in Washington, DC.